Feathers get damaged and look a little tatty over the course of a year, so it is perfectly normal for birds to replace them from time to time and look rather scruffy when they do! Most poultry will moult immediately after the breeding season: which in nature is a time that they have young and are vulnerable to predators whilst looking after their young. Some waterfowl even change their plumage patterns to an ‘eclipse’ plumage when they moult, which is more camouflage than the plumage they have during the breeding season and useful for attracting a mate. In nature, the moult also occurs at a time when food is abundant. This is a critical time when they will eat more and require extra protein in order to grow new feathers. Careful handling and sufficient high quality food is required during the moult. A Cream Legbar chicken looking scruffy in the middle of a moult. Chickens shed their feathers in late summer or early autumn when egg laying is due to stop but they will sometimes go through a partial moult at other times of the year too, especially if they have been stressed. A full moult in older birds can take two, even three months. You will see lots of feathers around their run when they are in moult and the birds will look very scruffy. Some chickens can look almost oven ready! Chickens usually stop laying eggs (which contain protein) and divert their energy into producing new feathers. Feathers are mainly made up of a protein called keratin, a dead substance formed by living cells. When feathers are fully grown, they do not receive nourishment from the body and are not living but whilst a feather is growing, it does require sustenance in order to build up keratin tissue. When feathers are growing, you will see feather shafts are full of blood. Growers (young chickens between 5 and 18 weeks old / point of lay) will shed their feathers twice during the first 6 months of their life although this is a much more gradual process and visually, youngsters still carry lots of feathers during their moult. 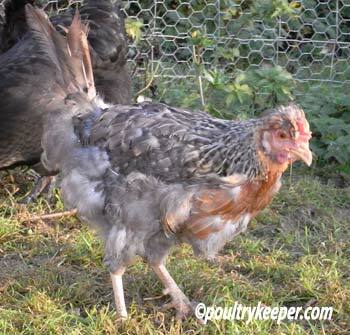 I have written a dedicated article about Chickens Moulting here, which goes into more detail. It provides information about why they don’t lay eggs and what you can do to help them through this difficult time. Waterfowl lose their flight feathers in one go which is different to most species of bird. They keep their inner down feathers but will pluck these themselves to line nests. They moult at the time of year when they would normally be looking after their (flightless) young in the wild and escape predators by taking to the water rather than flying off during this time. Waterfowl tend to moult much more suddenly than chickens. Geese moult once per year – both goose and gander moult at the same time – when the youngsters are a few weeks old. It takes them 3 or 4 weeks to replace their feathers. Ducks moult twice per year. Ducks and drakes moult at different times to one another. The drake moults into very colourful plumage for the spring breeding season to attract a mate but moults again into more camouflage feathers for the summer to avoid being spotted so easily by predators.